You know what it’s like. You’ve had your LinkedIn profile for quite a few years and gathered an eclectic bunch of connections. But what should you be doing with them? Are they of any value? Well that rather depends on what you want to achieve with you LinkedIn profile. How did that profile come about in the first place? Most people set up a LinkedIn profile because someone suggested they ought to have one. Often it’s because someone sent you an invitation to join LinkedIn because they tried to connect with you and couldn’t find you. Or maybe a colleague or recruitment advisor suggested it would be a good idea, especially if you are looking for a new job. Another reason might have been the person you met at a networking event who suggested you connect on LinkedIn. So you set up a profile, following the on-screen instructions adding each job, your school and university and any professional qualifications. Maybe you followed LinkedIn’s suggestion and added you e-mail contacts and automatically sent connection requests to them. 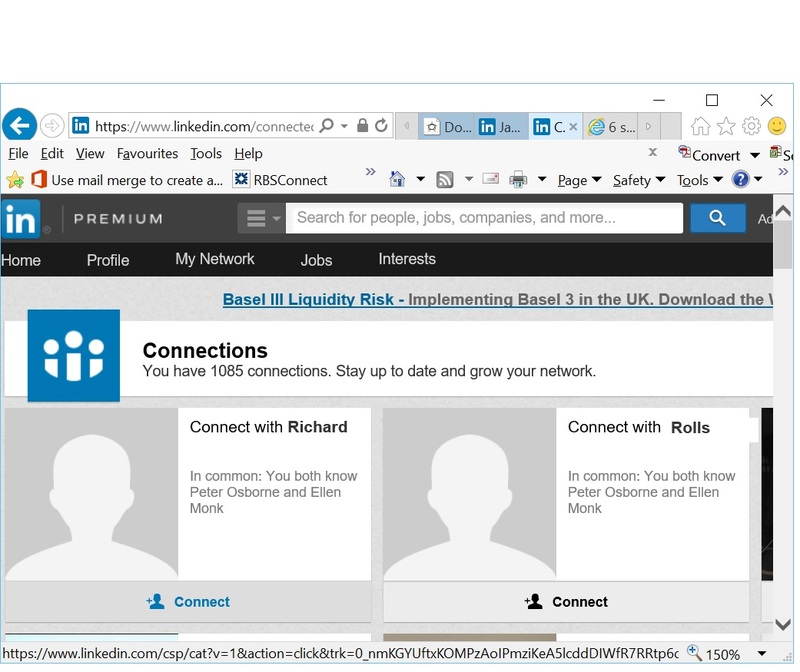 Or perhaps you clicked connect on some of the people LinkedIn suggested you might know. Or maybe people saw you had joined and sent you connection requests. Whichever way it happened , the connections started to role in and before you know it, it’s a few years down the line and you’re into a 3-figure list of connections. But that still doesn’t answer what you should do with your connections. Keeping in touch with networking contacts. But switched on business people are finding a powerful fourth use – to find and connect with their ideal client prospects, potential suppliers and future business partners. You see, the information that people put on to LinkedIn to satisfy the first three uses is just the information required to satisfy the fourth. And it’s all there in a closed and trusted network with a powerful search engine to help you sift and find those ideal targets. So what do you want to use LinkedIn to achieve? If it’s just to keep in touch with former colleagues and a few networking contacts, then you probably don’t need to do much with your connections. Maybe the odd update to your profile as your job role changes or evolves, plus the odd status update to let them know if anything interesting is going on. But frankly, you could do that on Facebook or through regular e-mails. The power of LinkedIn is lost on you. If someone were to ask you to connect with them what are you likely to do? If it were me, I’d be looking at their profile to see if they are the sort of person I want to connect with. What could they bring to me or my business. What opportunities could the present. If their profile is thin, incomplete or wishy-washy I’d think twice. If they held themselves out as some sort of expert, but their profile didn’t support that, I’d think twice. If their profile was all about how great they are, rather than the great things they do for their clients, I’d think twice. You see, your profile is your chance to showcase your expert authority. To demonstrate you skills and expertise. To show the huge benefits clients or employers can gain from working with you. So your profile needs to say all that before you engage with your connections to achieve your objectives with LinkedIn. So once you have a powerful personal profile, and you know what you want to achieve with LinkedIn, then you can start to engage with your connections. I am going to assume you are using LinkedIn for professional purposes and that any personal stuff with old colleagues or friends will be on a one-to-one basis. I would therefore recommend you keep your privacy settings open and include your contact details so you make it easy for you to be found. What that means is that anything you post by way of updates, photos or pulse posts are going to be visible you all your connections. So all such messages need to be congruent with you, the image you want to portray of yourself and your business or career, and the objectives you have for using LinkedIn. If you have different segments to your community like I do, make sure it is obvious from the post or update which segment it applies to. You should be keeping in regular contact with your connections. Use updates or posts to demonstrate your skills, knowledge and experience. Comment on other people’s updates. Join and contribute to relevant industry or interest groups. If you are using LinkedIn to develop your career it shows recruiters and potential employers you are engaged with your career. If you are looking to employ someone, it shows you potential candidates that are engaged. If you are using it for business development you are demonstrating your expert authority making you more attractive to potential clients, suppliers or partners. Whatever you are using LinkedIn for, you should seek out potentially useful connections. Do you have a target employer or sector? Do you have a target client niche or even target client company. LinkedIn provides a powerful search capability for you to find people in these situations. You can also look at their profile and see which groups they are members of and seek to join and contribute to those groups yourself. That is a great way to develop a reason to connect with someone. In summary, once you have decided what you want to achieve with LinkedIn, start the engagement process with your connections with that objective in mind. 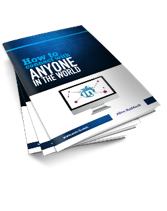 If you want more tips on how to connect with anyone in the world, sign up for my free guide of the same name by clicking on the link or the image. 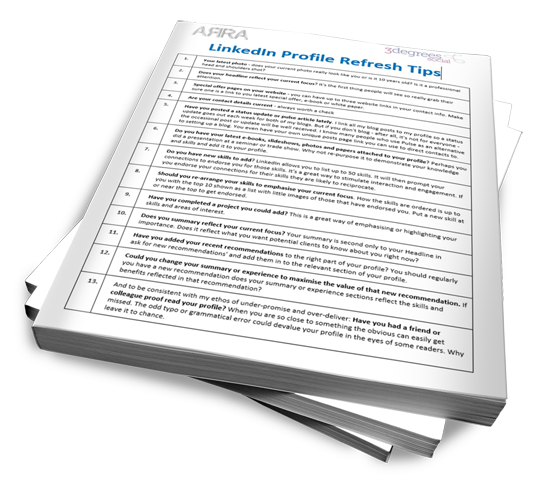 Your LinkedIn profile is the ideal place to demonstrate your expert authority. It’s also the first thing most people are likely to find if they go looking for you. Google your name and you LinkedIn profile will be up there at the top of the listings. So it makes sense to ensure your profile is up to date and reflects the current focus of you and your business. I update my profile on a regular basis. I post updates linking to both my weekly blogs but I also do a deeper review every couple of months. I look at the wording of my Headline, summary and current roles in my Experience sections to make sure they reflect what I am focussed on at the moment. I constantly ask colleagues, contacts and clients for feedback on my profile to make sure it delivers what they need from me. And when I make a change, LinkedIn automatically sends a notification to my connections, reminding them about me, demonstrating I ‘walk the talk’ – i.e. I actually do what I recommend my clients do. Your latest photo – does your current photo really look like you or is it 10 years old? Is it a professional head and shoulders shot? Does your headline reflect your current focus? It’s the first thing people will see so really grab their attention. Special offer pages on your website – you can have up to three website links in your contact info. Make sure one is a link to you latest special offer, e-book or white paper. Have you posted a status update or pulse article lately. I link all my blog posts to my profile so a status update goes out each week for both of my blogs. But if you don’t blog – after all, it’s not for everyone – the occasional post or update will be well received. I know many people who use Pulse as an alternative to setting up a blog. You even have your own unique posts page link you can use to direct contacts to. 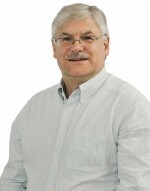 Do you have your latest e-books, slideshows, photos and papers attached to your profile? Perhaps you did a presentation at a seminar or trade show. Why not re-purpose it to demonstrate your knowledge and skills and add it to your profile. Do you have new skills to add? LinkedIn allows you to list up to 50 skills. It will then prompt your connections to endorse you for those skills. It’s a great way to stimulate interaction and engagement. If you endorse your connections for their skills they are likely to reciprocate. Should you re-arrange your skills to emphasise your current focus. How the skills are ordered is up to you with the top 10 shown as a list with little images of those that have endorsed you. Put a new skill at or near the top to get endorsed. Have you completed a project you could add? This is a great way of emphasising or highlighting your skills and areas of interest. Does you summary reflect your current focus? Your summary is second only to your Headline in importance. Does it reflect what you want potential clients to know about you right now? Have you added your recent recommendations to the right part of your profile? You should regularly ask for new recommendations’ and add them in to the relevant section of your profile. Could you change your summary or experience to maximise the value of that new recommendation. If you have a new recommendation does your summary or experience sections reflect the skills and benefits reflected in that recommendation? And to be consistent with my ethos of under-promise and over-deliver, Have you had a friend or colleague proof read your profile? When you are so close to something the obvious can easily get missed. The odd typo or grammatical error could devalue your profile in the eyes of some readers. Why leave it to chance. 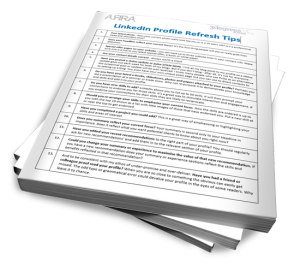 Just as with my 12 engagement ideas, I have created a pdf of the profile refresh tips. Download a copy here, print it off and diarise a regular refresh of your profile. I recommend taking a look at least every two months. You don’t need to use each idea every time, but be sure to keep your profile fresh in the minds of your connections. You’ve probably heard the saying in marketing circles “the money’s in your list”. But the amount of money in your list depends on the quality of your list. How engaged is your list? Engaging with your e-mail list is both easy – you send them e-mails – and hard. However good your e-mails are it’s still not really 1:2:1 and most recipients don’t interact. But if you are on LinkedIn, your connections are part of your list. A very special part of your list. Your connections have taken that extra step to connect with you. It’s more than any lead magnet sign up. And you have a huge range of ways to engage with them. Some are broadcast type engagements just like to your e-mail list. But the difference with LinkedIn is that messages tend to get read whereas open rates on e-mail broadcasts are sub-50% at best. An e-mail update of one of my blog posts to my connections prompted one of them to ask if I was interested in a consulting assignment in Oslo. A simple ‘happy birthday’ message to an old client connection, prompted by LinkedIn, lead to an assignment to upgrade a system I had built for them. Three different engagement scenarios, three pieces of business. Post a status update – what you are doing, what do you need help with. Or maybe do like I do an send a status update linked to your blog posts. That’s what prompted one of my connections to ask what I was up to and would I consider an assignment in Oslo. Post on Pulse, the LinkedIn publishing platform. Now you don’t need a website and a blog top publish articles. Anyone can publish using Pulse. Use to promote you views, ideas and experience. Update your profile. Providing you have notifications switched on any changes to your profile will cause LinkedIn to send a notification to your network. Respond to a LinkedIn prompt – birthday, new job, anniversary, profile change. It was a response to such a birthday notification from an old client that led to a new opportunity for me. Endorse someone. LinkedIn endorsements are where you can endorse a connection for one of up to 50 skills and they can do the same for you. In fact reciprocation is common place and LinkedIn will prompt you to endorse your connections. It’s a simple way to start an engagement sequence. Thank someone for endorsing you. As for 5, but this is where you respond to a connection’s endorsement of you. Ask for a recommendation. For any connection you have worked for or with, asking for a recommendation is a great way to get recognised for your capability. If you ask in the right way, most people will respond positively. Having recommendations on your profiler is hugely powerful in building your expert authority. Publish a new e-book, slide-share or video and add it to your profile. Demonstrate your knowledge, skills and capabilities by creating something to share. Adding it to your profile satisfies 3 above but you could send a draft to key connections you want to engage with and ask for their feedback before you publish. Comment on your connections’ status updates. Besides anniversaries, birthdays and changes top profiles, you will also get notified of any status updates posted by your connections. Commenting on or replying to a status update is a great way to engage and demonstrate your own knowledge and experience. Post in a group. Join a range of LinkedIn groups. Try to identify those where your target prospects hand out and then demonstrate your knowledge and experience by posting comments, questions and articles. It’s a great way of attracting potential clients. Comment on someone else’s post in a group. As in 9 your comments on the group posts of others is a great way to prompt engagement. Groups also provide potential future connections and a post you both comment on can be used as the catalyst for connecting. Start a group. You can even start a group of your own. I have known people to create a group focussed on their own specific area of expertise. It can create a captive audience if managed properly. Didn’t I say I had 12 tips for engagement? Well I always try to under-promise and over-deliver, so here is number 13. It’s the easiest one of all – just say hi to an old contact – ask how they are and tell them what you are up to. LinkedIn acts as a mini CRM system and records all your interactions so just page throw your connections and reach out to someone potentially useful that you haven’t contacted for a while. My recommendation is that you use one or two of these ideas each day to engage with your connections.It will only take a few minutes and like the examples I gave at the start, it can really pay dividends. To make it easy for you I have created a pdf of these LinkedIn engagement ideas. Download a copy, print it off and keep it by your PC to remind you. I’m also going to tweet two ideas at random, one at 8:00am and one at 8:01am so follow me on Twitter – @AllenRuddock – and get your daily reminder. Why not set a reminder on your phone too.